At first I was taken aback by the request. It came from one of my transgender interview subjects for a research project that I have been working on about closeted LGBT (lesbian, gay, bisexual and transgender) service members in the United States military. Since 2009, I have interviewed and photographed over one hundred such individuals affected by the now repealed “Don’t Ask, Don’t Tell” laws that until recently had prohibited gays and lesbians from openly serving in the United States military. I have also included in the series those impacted by the current policies that discriminate against transgender individuals who undergo gender transitions. My methodological practice involves in-depth interviews, ethnography and collaborative portraits of each person to generate greater understanding of their identity and experience. In the photographs I take of them, I employ various creative strategies that use lighting, cropping and body positioning to ensure that their identities are concealed in some way. In this case, even though I had already photographed many other military service members, J’s specific request seemed to be both personal and intimate in a way no other one had been. Not sure what to make of it, I simply said, “Sure,” since the request seemed to be significant in a way I had not yet completely understood. We met in my hotel room where I set up the lighting that I wanted for the photograph and told him that I was ready. As he took off his shirt, he revealed two scars where breasts had formerly been. 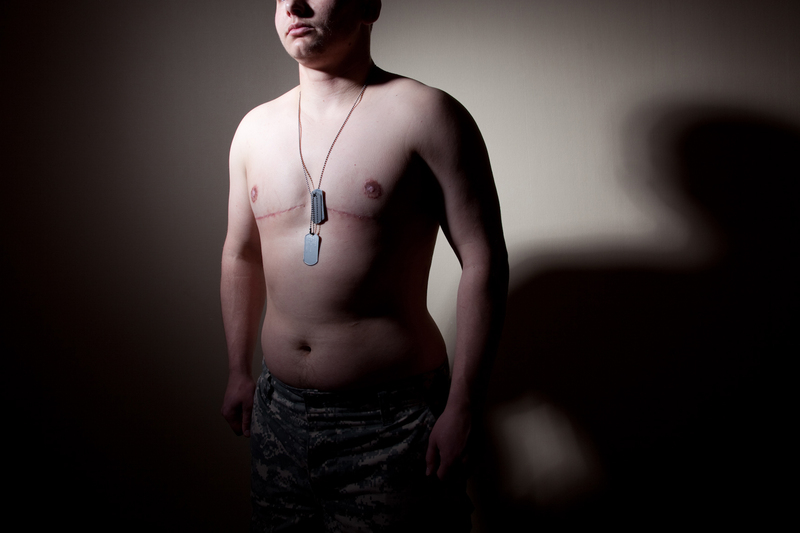 Two military dog tags hung from his neck, resting around his sternum, framing these scars as if they were battle wounds from war. As my camera shutter whirred a soft hum punctuating the silence in the room, I was struck with a revelation about the complicated nature of how gender permeates our lives. Of course I reflected on the process of how gender is constructed and reconstructed through interaction by the now infamous theory described by West and Zimmerman (1987) as “doing gender.” Yet this experience for me showed something even deeper – the personal and psychological attachment that we each ascribe to gender meanings and identifications. In the conclusion of her book, “Just One of the Guys,” sociologist Kristin Schilt notes this complicated relationship transgender men have with the interactional and macro-level societal constructions of what “being a man” entails, and their equally compelling deeply personal and pleasurable individual attachments to their self-determined gender identity: “This pleasure comes from finally gaining a social maleness that aligns with their personal, often long-standing, sense of being male.” Schilt further theorizes, “Perhaps the problem with doing gender as a theory is not the focus on accountability but the lack of focus on the pleasure that can come from experiencing this coherence” (2010:174-175). As I photographed J’s body, I realized the power and significance of this pleasure. This visual document of his transition was an image that proved his ability to wrestle some control over a process that had often been overly and inappropriately constructed for him previously, and was a milestone in his life, one that deserved a needed coherence. This photograph, my visual proof of the collision between structure and agency, power and pleasure, doing and being, was evidence of the complicated sociological nature of gender processes that permeates each our lives and the important role that photographic images can have in revealing these understandings for us. Two figures, dressed in black and white, appear to share an intimate moment together, seemingly unaware of the photographer Rachel Tanur. Tanur is separated from the couple both by distance and the presence of two large vertical columns that she has used to frame her subjects. 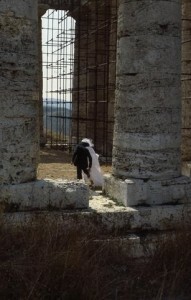 The image is titled, “Greek Temple Newlyweds,” and from this we can infer the moment and place: a joyous ritual celebrated and a location that symbolizes ancient myth and creation. The photograph evokes the spirit of the famous art photographer Nan Goldin, who pioneered the late-twentieth century photographic aesthetic known as “personal documentary.” This practice is one where a photographer uses their own life as source material, and while the images capture something personal and specific, they also serve as allegories about common human existence. Goldin’s seminal 1986 publication, "The Ballad of Sexual Dependency," were photographs of herself, friends and lovers, as they experienced the fluid underground punk rock culture of New York City’s lower east side. And while Goldin’s photographs were very much her own visual diary, they now simultaneously exist as powerful representations of life, love and death – universal themes shared by society. Upon deeper introspection of Tanur’s photograph, this moment becomes much more than just a snapshot of two newlyweds. The man appears to be bracing his bride, one supporting the other. His black suit is made even darker by the brightness of her white dress, two opposing figures brought together by life. Their mutual support is accentuated by the surrounding wood scaffolding, one beam holding each one after it, a structure whose purpose is to renew the old building around them. The two slowly head towards the horizon, the mountains in the background reveal a windy path, but we are unsure what direction they will take. Yet the most important part of the image is Tanur’s usage of the two imposing columns that occupy the majority of the space we see. Aged and weathered, the two marble pillars mirror the couple and foreshadow the inevitable process of time passing, notably a separation brought by death. In just this one fleeting moment, Tanur brings to us this universal gesture: the old framing the new, renewal amidst deterioration, love with its back turned away from death – a powerful visual representation of what we all commonly share as life passes on. Two figures, dressed in black and white, appear to share an intimate moment together, seemingly unaware of the photographer Rachel Tanur. Tanur is separated from the couple both by distance and the presence of two large vertical columns that she has used to frame her subjects. The image is titled, “Greek Temple Newlyweds,” and from this we can infer the moment and place: a joyous ritual celebrated and a location that symbolizes ancient myth and creation. The photograph evokes the spirit of the famous art photographer Nan Goldin, who pioneered the late-twentieth century photographic aesthetic known as “personal documentary.” This practice is one where a photographer uses their own life as source material, and while the images capture something personal and specific, they also serve as allegories about common human existence. Goldin’s seminal 1986 publication, "The Ballad of Sexual Dependency," were photographs of herself, friends and lovers, as they experienced the fluid underground punk rock culture of New York City’s lower east side. And while Goldin’s photographs were very much her own visual diary, they now simultaneously exist as powerful representations of life, love and death – universal themes shared by society. Upon deeper introspection of Tanur’s photograph, this moment becomes much more than just a snapshot of two newlyweds. The man appears to be bracing his bride, one supporting the other. His black suit is made even darker by the brightness of her white dress, two opposing figures brought together by life. Their mutual support is accentuated by the surrounding wood scaffolding, one beam holding each one after it, a structure whose purpose is to renew the old building around them. The two slowly head towards the horizon, the mountains in the background reveal a windy path, but we are unsure what direction they will take. Yet the most important part of the image is Tanur’s usage of the two imposing columns that occupy the majority of the space we see. Aged and weathered, the two marble pillars mirror the couple and foreshadow the inevitable process of time passing, notably a separation brought by death. In just this one fleeting moment, Tanur brings to us this universal gesture: the old framing the new, renewal amidst deterioration, love with its back turned away from death – a powerful visual representation of what we all commonly share as life passes on.